Each Bar is 8 oz. As good as I make at home, says the children! My boys and I make cheese. I teach cheese making classes.My boys are foodies, and your best or worst critic. We love the flavor of the cheeses in the variety pack - and we didn't have to do the aging! I like this variety pack because it contains a nice variety of the flavors. It ranges from plain to very spicy. I really like all that I have tasted. Bought two -- one for snacks at office party. The other to be placed in the tote along with the spreads, crackers, etc., for the big 'family' gathering at Christmas. This has an awesome selection of different flavors -- quite the variety! Horseradish was excellent, big hit with all of us.Tomato Basil has a great taste, but crumbled as we cut it.The sharp and extra sharp cheddar have a great flavor, I generally don't like sharp cheese, but these both hit the mark. We visited Vermont two years ago and we took a side trip to visit Cabot Creamery where we sampled various (many) types of their cheeses. We immediately fell in love with it! 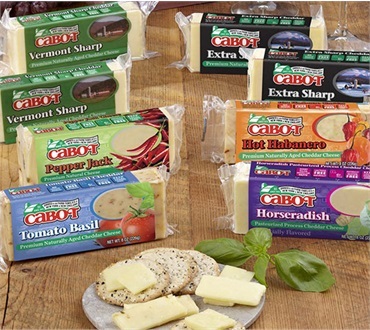 Now, we give Cabot cheese boxes as Holiday gifts to family and friends, and we keep a wide supply on hand for when we entertain friends. No one is EVER disappointed! This is the best cheese we've found in the U.S., and it compares favorably with any cheese anywhere.